Click on the picture on the left for a full size photo of the design for reference while stitching. The design is worked on 25-ct. cream Dublin linen and features Waterlilies silks from the Caron collection. Note: All stitch diagrams follow the stitch through its progression and show the actual threads of the fabric. 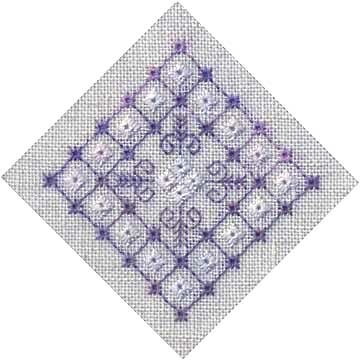 The outside diamond border is worked in Algerian Eye Stitch using two strands of Cafe Au Lait. (See figure 1.) Pull each leg of the stitich in order to create a hole in the center of the stitch. These eyelets are then connected with Back Stitches using ONE strand of the Cafe Au Lait. (See figure 2.) Be careful not to drag the tail of your silk across any of the center in the eyelets as you travel. the daimond shape motifs are worked in Diamond Eye Stitch using two strands of Opal. (See figure 3.) Pull each leg of the stitch gently in order to create a hole in the center of the stitch.